Round pie is so overrated sometimes. Sometimes you just need a pie bar…something that’s no hassle to cut, share, and get out of the house before you shove it all in your face. 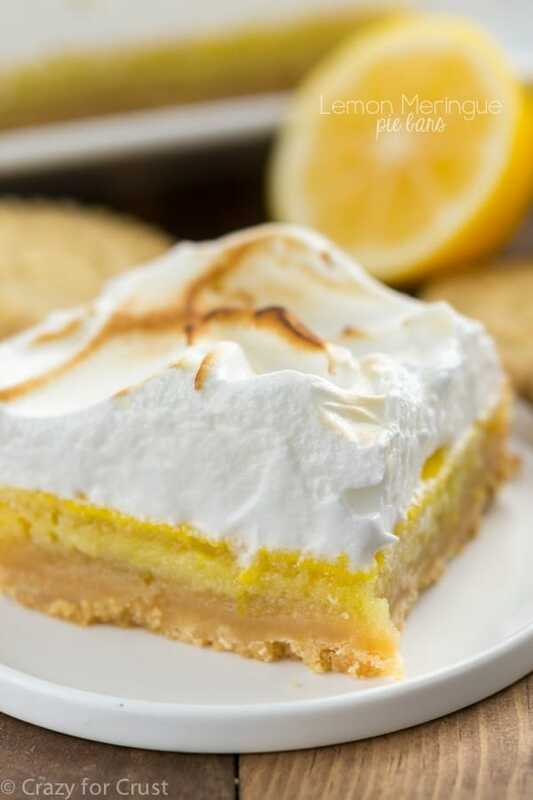 Kind of like these Lemon Meringue Pie Bars. I turned lemon meringue pie into pie bars. Then I shoved meringue in my face, the end. If you’ve ever read my love story about Mel, you’ll know that we didn’t date very long before we got engaged. We fell pretty hard for each other fast and we didn’t want to be apart – ever. Who’d have thought that 14 years later I’d be writing about our love story on a blog full of desserts that he never tries? Now that’s love. Shortly after we got engaged Mel had to go on a business trip to London and Belgium for 2 weeks. I was crushed. Devastated! Two whole weeks without my guy. What was I going to do???? I gave him one request: bring me back cookies and chocolate from London. And boy, did he. He filled his entire suitcase with chocolate bars and Walker’s Shortbread. It was a Dorothy-gained-5-pounds suitcase. That’s marshmallow meringue. It’s my favorite kind of meringue. Actually, to be truthful, its the only kind I’ll make. That other stuff you whip and bake is so…eggy, I just can’t deal. Marshmallow meringue? We’re BFFs. And when you top lemon meringue pie bars with marshmallow meringue, that’s a good day. An even better day? When the crust is made of Walker’s Shortbread Cookies. Luckily, you don’t have to go to Europe for them. They sell them at your regular grocery store! I’ve been eating Walker’s Shortbread all of my life, it seems. They’re my favorite shortbread cookie, hands down. I have no idea where I first tasted it but you never forget that first bite. Buttery, crunchy yet soft, the cookies are so good you can’t just eat one. One package = one serving. Or no? My bad. Walker’s Shortbread has been around for over 200 years and it’s still a family owned company. Their shortbread is made using only the finest butter from free-grazing, small herd cows and their shortbread, cookies and oatcakes contain no artificial flavorings, colorings or additives, and are certified Kosher OUD. They even make a gluten-free shortbread! In short, their shortbread is just that…shortbread. The perfect cookie. And a perfect shortbread cookie made into a crust? Even more perfect. Okay, so let’s breakdown the recipe. Obviously, the crust is made of Walker’s Shortbread Cookies. The thing I love about shortbread cookie crusts is that you don’t need to use as much melted butter to get the crumbs to adhere to each other as you do with a normal cookie. The cookie itself has a high butter content, making it almost crust-ready just when it’s crumbled. Depending on the size of the box of shortbread you use, you’ll want about 1 1/2 boxes of cookies. (My boxes were 5.3 ounces each.) You mix that with just a few tablespoons of melted butter, press it into the bottom of a 9″ square pan that’s been lined with foil, and you bake it for 14 minutes. You can’t skip the foil folks, sorry. Unless you want to eat the bars from the pan with a fork, you need to be able to remove them easily. Line the pan with a nice long piece of foil so you can easily remove the entire slab from the pan later on. On top of the wonderful shortbread crust goes a lemon bar mixture. I debated spreading lemon curd on top but I did that last week and I also wanted a more firm bar that would work for a pot luck. I decided to adapt my lemon bar recipe to turn it into these bars. You bake the bars, then you need to let them cool completely. Do not even try to remove them from the pan or remove the foil until they’re cooled and chilled. I chilled mine overnight just because of timing, but a few hours would work just fine. Then you make your meringue, and the angels sing. Whisk your egg whites and the sugar in a heat-proof bowl over a pan of simmering water. Don’t stop whisking – you don’t want scrambled sugary eggs. Let the mixture cook while you whisk until it’s about 140°F. It takes a few minutes. I tested my temperature with my candy thermometer. 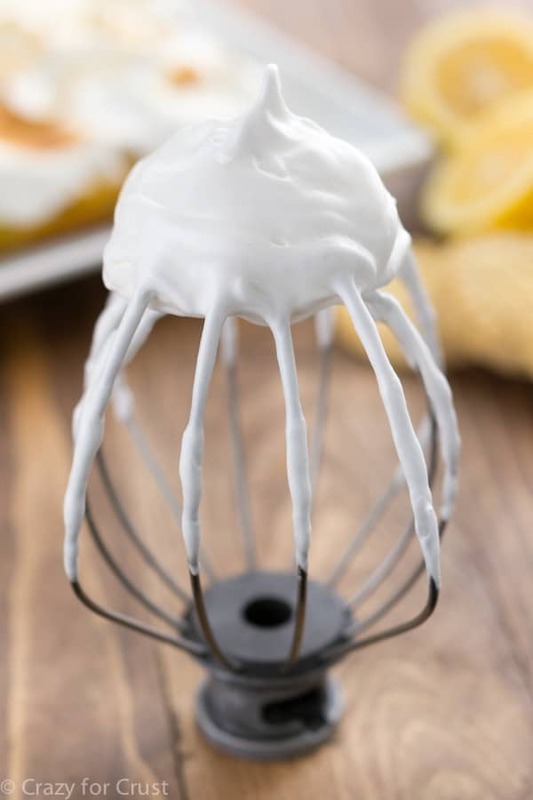 Immediately add it to the bowl of a stand mixer and beat with the whisk attachment for several minutes until it stands up on it’s own – like in the whisk photo above. That’s it! Then you frost your bars and either broil or toast with a blow torch. I recommend the blow torch, it’s more fun. Then you cut them and eat them. The marshmallow meringue is so much better than normal meringue. 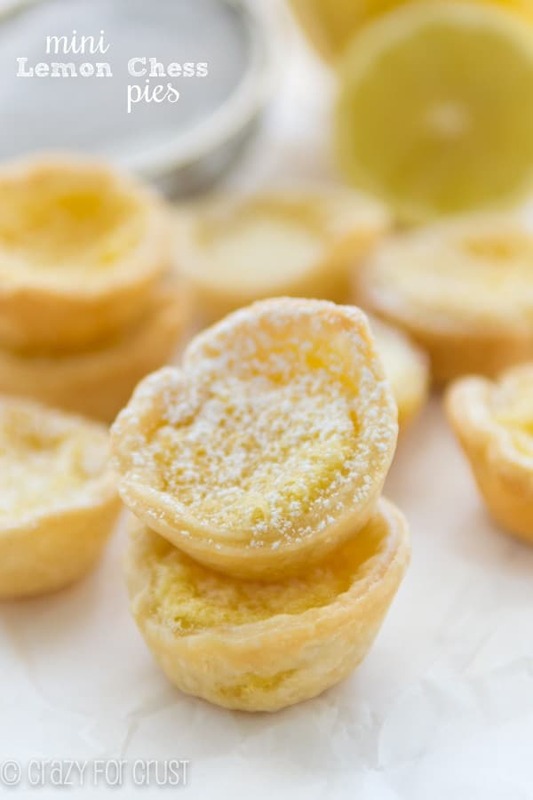 It’s sweet and delish and it pairs so well with the tart lemon and buttery crust. These lemon meringue pie bars are totally portable, unlike regular lemon meringue pie. 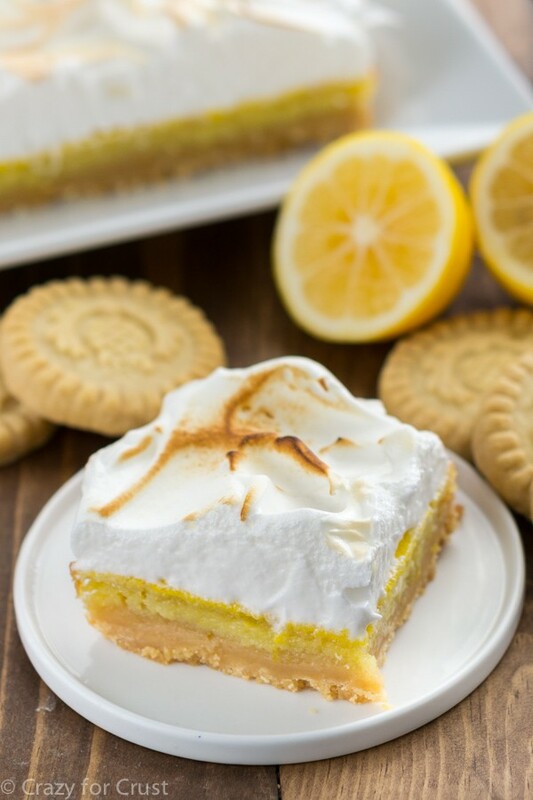 A shortbread crust is topped with a lemon bar mixture and then the whole pan is frosted with a marshmallow meringue topping! This post was sponsored by Walker’s Shortbread. All opinions are 100% my own. 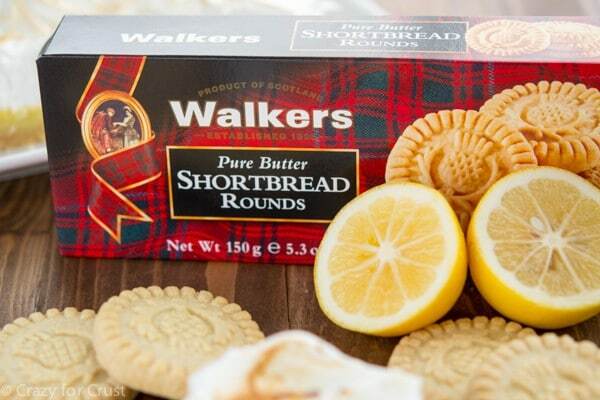 Because who doesn’t love Walker’s Shortbread??!! WOWZER! These look ahhhMazing! 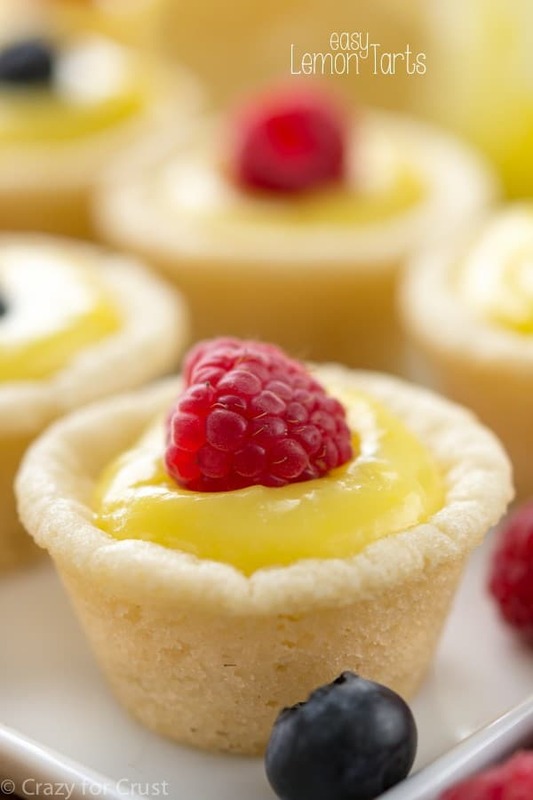 I love that lovely cookie crust with the lemon! Man that is so sweet! What more proof do you need; that suitcase is love for sure. Ok these bars – what the what?? Lemon meringue pie in a BAR? Mind.blown. Would you mind bringing me a suitcase full of these? 🙂 Pinned! Awww it was the same for me and my hubby – we weren’t even dating a year before he proposed 🙂 These lemon meringue pie bars look so yummy! Ahh! What a cute story! These look yummy too! Okay, so if I NEEDED to make these, like, now, and I happened to have a bottle of key lime juice in my fridge from making your AMAZING key lime cheesecake and key lime curd, could I possibly get away with skipping the zest and still having an amazing tasting product? Because let’s be real, I don’t feel like going to the grocery store just to pick up a puny little key lime to zest, mostly because of the whole “needing to make these now” thing. I have been wanting to make pie bars forever and these lemon ones look like a good place to start! You seriously knocked this one out of the ballpark. For real? Shortbread crust? I am all the way sold! I love that you guys got engaged so quick! So did Cory and I. <3 Also those Walkers shortbread cookies are the BOMB! I can't believe you made a crust out of them! Oh wait, I can lol! You really are the queen of desserts, yum! aww, what a sweet love story. Any man who is lucky enough to get with me someday (wink) will have to know that chocolate and cookies are the way to my heart. And a little lemon never hurt either! Which reminds me of a funny story: today at work there was a going away party for someone and there was only a fruit and veggie tray. To which I told my friend/coworker- if there is only veggies and no sweets at my going away party I will think that no one I worked with ever liked me. HA! 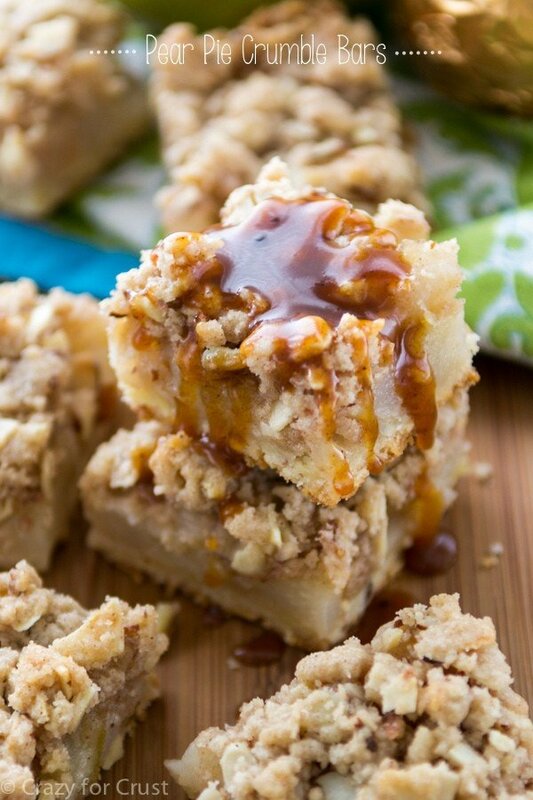 Ok, I’m rambling, but I am pinning this recipe for sure. Looks like a great dessert for Easter! I made the lime version, and they turned out great! My fiance won best dish at his work potluck! I had never made meringue before, and I think now I’m obsessed. Thank you for the great recipe! I just made these and they are unbelievably heavenly! Lemon bars are one of my favorite treats and I have a great recipe that always gets compliments. 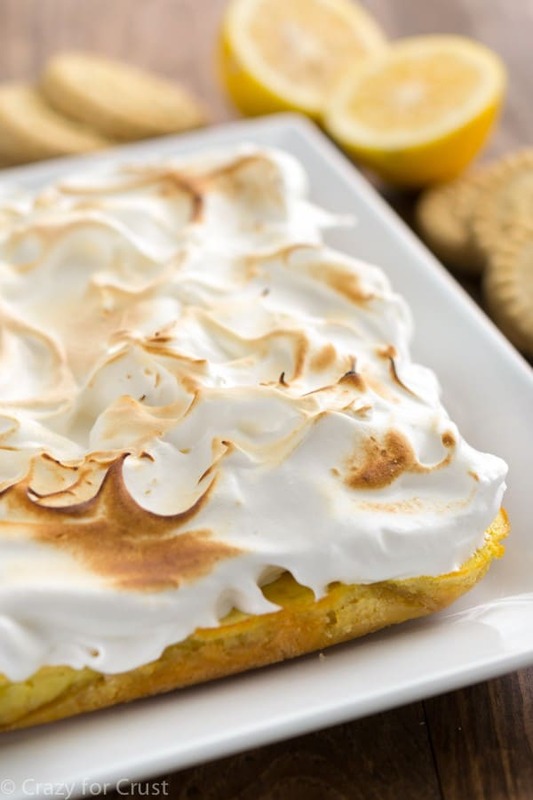 However, the marshmallow meringue really takes lemon bars up a notch – from good to fantastic. 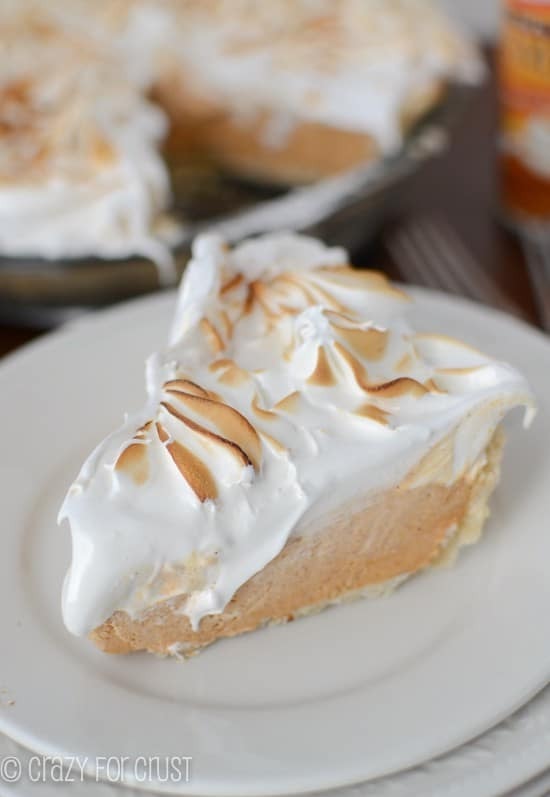 And you are right, marshmallow meringue is so much better than regular – I will never make regular again. I used the bowl of my kitchenaid mixer as the top of the “double boiler” and then just moved it right over to the stand, attached the whisk, and whipped away. Easy! The process seems intimidating but it was actually very simple. Don’t be afraid to try it, friends. I’m so glad you enjoyed this!! I know, marshmallow meringue is just SO good, so much better than the other. And great tip about the bowl. Totally doing that next time!